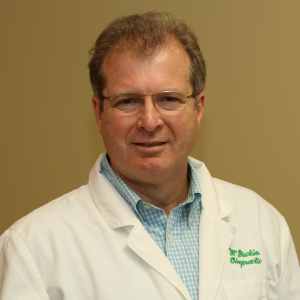 Dr. McGuckin’s first experience with chiropractic was in high school. “I had terrible muscle spasms in my neck and upper back, and nothing seemed to help the constant pain I was in.” His energy levels dropped, and headaches were a daily occurrence. With his frustration growing, his mother suggested they visit a chiropractor, he agreed. Dr. McGuckin was surprised, however, that he had to continue seeing the chiropractor to fix his problem. Later on, this would lead to his interest in nutrition and how it allows the body to better hold a chiropractic adjustment. His experience with the chiropractor made a strong impression. Along with his curiosity about the underlying cause of his health problems, it directed him toward the chiropractic profession. It’s important to Dr. McGuckin that he stay up-to-date on the latest research and knowledge in the health profession. President of the American Chiropractic Association’s Board of Chiropractic Internists, 1995-1997. President of the American Chiropractic Association’s Council on Family Practice, 1997-1999. District One Director for the Indiana State Chiropractic Association, 1999-2002. Vice President of the American Chiropractic Association’s Board of Chiropractic Internists, January 2001-July 2002. Dr. McGuckin is married with five children. We offer convenient early appointment times to accommodate your busy schedule. Contact us today to schedule your time!